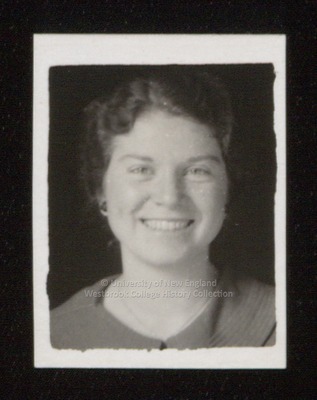 A ca.1934 Westbrook Junior College student portrait has written in pencil on the back L. Clement?. Miss Clement? 's dark hair is parted almost center and is softly waved over her ears. She smiles directly into the camera and wears a single chain around her neck, which is partially covered by a large collared blouse or jacket.